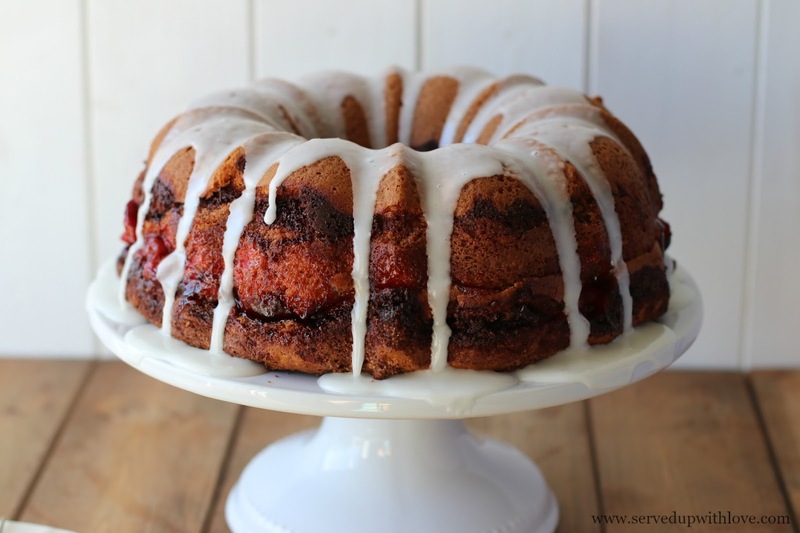 Easy Cherry Coffee Cake is so moist and packed with so much cinnamon flavor, its crazy! This is one of the recipes from my mom's recipe box. 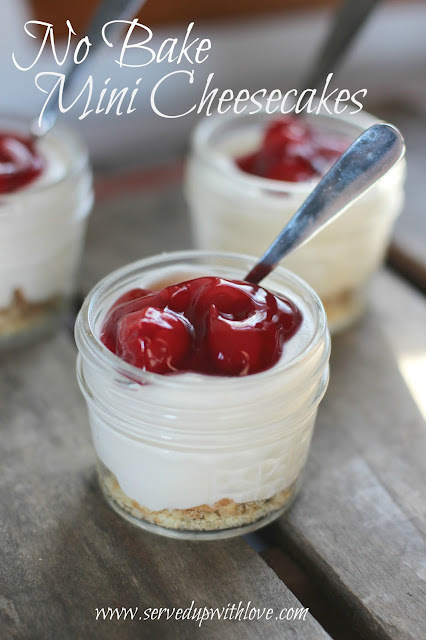 I made it just like it called for in her recipe and then I decided to jazz it up a bit with some cherries. I open up a little in this post so its kind of long. If you want to get straight to the recipe, just scroll on down. These recipes tug at my heart since I lost my mom. She passed away so quickly 6 months ago and I am still trying to grasp it all. It is hard to explain to someone who has never lost a parent, let alone your mom, just how much it hurts. But I didn't only lose my mom, I lost my best friend. She was the one I always turned to when I needed a listening ear. She may not have always told me what I wanted to hear, but she knew what to say. I still find myself wanting to pick up the phone and dial her number. And it comes at the weirdest times too. Nothing prepares you for the trials you will face losing a parent. But that is not where my grief began. The year 2017 had to be the hardest year of my adult life. On January 2nd, my dad passed away in his sleep. He had suffered from Parkinson's disease for years and even though it was hard, we were expecting it. Nonetheless, it still hurt like you would not believe. I was glad he was no longer suffering. He had become completely bed ridden. He was unable to do any of the things he enjoyed anymore. He loved woodworking out in his garage but had not been able to do that in several years. My dad was also a reader. He loved books, westerns mostly. He could read a book in a day. I think it helped him escape the prison that this disease put him in. But the last year or two his eyesight was rapidly declining and he could no longer do the one thing he enjoyed the most. Even watching television was becoming difficult. He required round the clock care and that care came from mom. The rest of us stepped in when needed but mom was his rock. She put his needs before her own. She did everything in her power to keep him home where he wanted to be. Her health was already declining before his death but we just had no idea how much. We all just thought she was exhausted from taking care of him 24 hours a day. She was but there was so much more going on then we all realized. Fast forward to September 2017. She was admitted into the hospital and was diagnosed with stage 4 lung cancer. A week later we were saying goodbye. We didn't even have time to grasp what was being thrown at us. I had so much to say to my mom. So many more memories to make. So much more love to show her. So little time. My parents never had a lot of material things. What they lacked in material things, they made up for it with love. They loved each one of us girls (there is 3 of us) unconditionally. They gave us the best life we could possibly have. They made us the center of their world. Every event was celebrated. Every holiday we all gathered together and we ate, we laughed, we loved, and we made memories. Each passing year as our families grew their house got smaller and smaller but the love between us was so much bigger. The house was now filled with son in laws, grandkids, and then great grandkids. So much love was packed into that tiny house. All the memories keep flooding back to me. I've been lost. I've been struggling. I've been heartbroken. Who am I? Am I the same person I've always been? A year and a half ago I could have answered that question without hesitation. When I see my own reflection, its hazy, its blurry, and I can't find focus. Every day is a struggle to find my place. I've kept myself busy. Busy trying to forget the hurt. Busy has been good. The quiet times are the struggle. When I sit down to write up a new recipe, my mind goes blank. So I walk away. Leave it for another day. And the days in between get longer and longer. I haven't stopped cooking, I just stopped writing. My hope is that this helps me heal. Helps me find my way back to me. A little more whole, a lot less shattered. Thank you for sticking around while I pour it all out. Its been swimming around in my head for a while. It was time to let it out. Now to this cake. 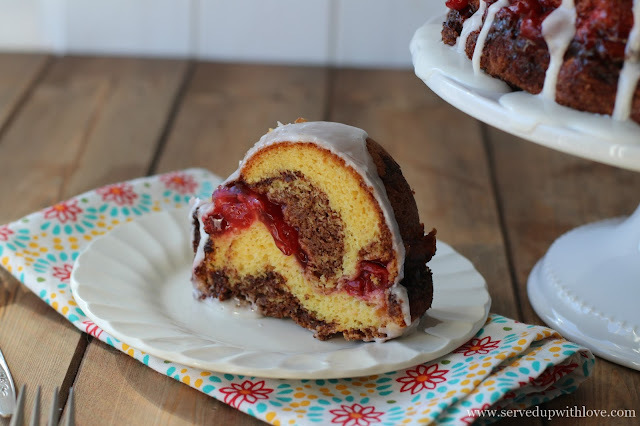 Oh my goodness, was this Cherry Coffee Cake good. 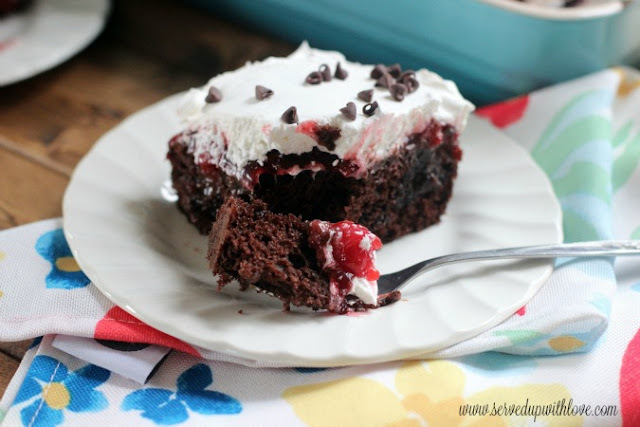 The cherry pie filling just brings this already delicious cake right over the top. 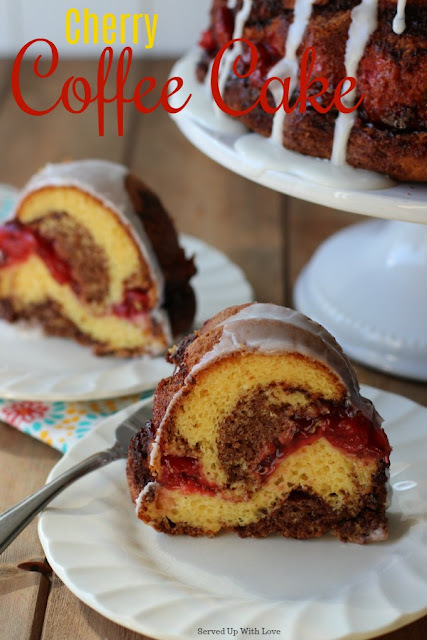 Enjoy with a cup of coffee for breakfast, or just for a great dessert. A moist and delicious cinnamon and cherry coffee cake the is perfect for breakfast or an easy dessert. Preheat oven to 350 degrees. Mix first 6 ingredients together. Pour half of the cake batter into a greased and floured bundt pan. In a separate bowl, combine brown sugar and cinnamon. Swirl half of the cinnamon sugar mixture into the cake batter. Spoon cherry pie filling over the cinnamon sugar mixture. Add the remaining cake batter. Then swirl the remaining cinnamon sugar mixture on top. Bake in a 350 degree oven for 50 minutes or until cake is done. Cool on a wire rack. To make a glaze. Combine 1 cup of powdered sugar with 1 to 2 tablespoons of milk. Mix until desired consistency. It will be thick. Drip over cake. This sounds and looks really good. 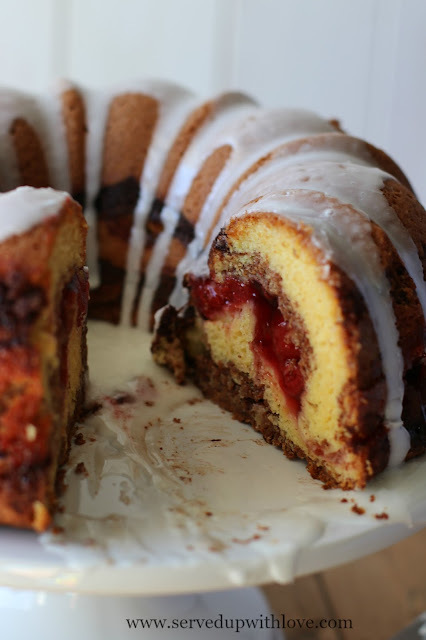 When I make it I will also add some pecans to it. I understand what you are talking about when saying your mom was not just your mom but also your best friend. I had moved back home to live with my mom in 2000 to help her and take her to appointments. She went into the hospital with pneumonia but ended up being dismissed on hospice care. She has been gone for one year and I still miss her greatly. I think the addition of pecans will be great for this cake. They certainly take a piece of you with them with they go. Each day gets a little easier as far as being able to talk about them without totally losing it. I miss them terribly every day. God bless you for putting a hold on your life to take care of her. Much love to you. The new normal takes time. Thankfully, we have wonderful memories that will never be taken from us. Thanks for the recipe. Take good care of yourself. God bless! 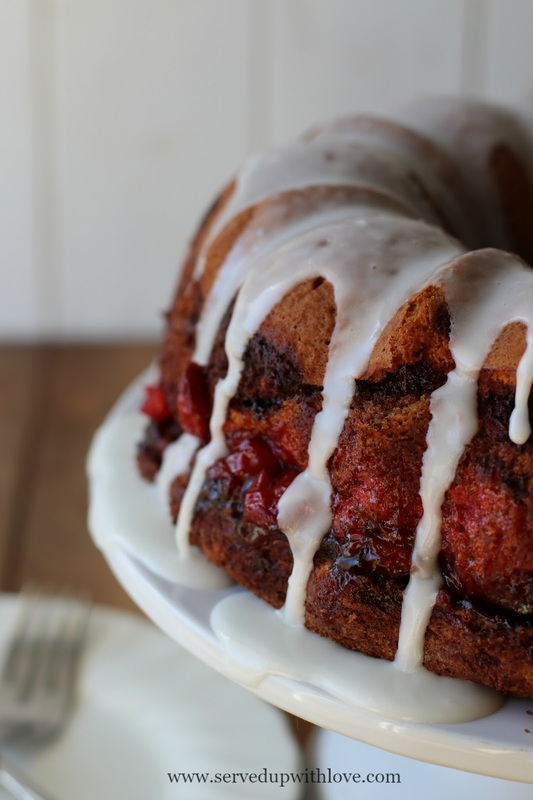 The easy cherry coffee cake is the best cake I have ever eaten, everyone says the same thing. Thanks for the recipe!!!!! I love hearing that Priscilla! I am so glad you enjoy it! Great article. Can't wait to try this out. Just love this. Thanks a lot for sharing.